Based on powerful true stories of the workers, Channel 4’s The Mill focuses on the lives of the mill hands against a backdrop of significant social and political changes following the Poor Law Amendment Act of 1834, which made a distinction between ‘deserving’ and ‘undeserving’ poor at the time of the Industrial Revolution. I caught up with BAFTA nominee actress Kerrie Hayes, who plays Esther Price in the series. This lass really has ‘gone through the mill’. She’s had her golden locks shaved off, she’s been locked in a room with a dead person and fought in the streets campaigning for workers’ rights. Life couldn’t get much tougher, but it does. She loses her baby due to starvation. Kerrie’s talking about her role as Esther Price, a real-life mill activist who was a force to be reckoned with. “I wish I could have seen a picture of her but there isn’t one,” she says. In the last series, Esther loses her baby boy named Billy due to lack of food. In The Mill’s version, it shows her burying her child and returning straight back to work, slightly different from the facts. “I discovered that she took a whole month off after the baby died, which seemed highly unusual in those days,” says Kerrie. To add insult to injury, she was locked in a room with the deceased Mrs Timperley, a superintendent for the Apprentice House. This was historically correct, and the scene was filmed in the actual room where it happened more than 100 years ago. “We filmed the scene in that very same room. I only became aware of it on the first day of the shoot, it was really strange,” says Kerrie. The series is filmed at Quarry Bank Mill in Cheshire, once an active cotton mill, and Kerrie was shown how to use a working loom. Probably just as well Kerrie is living in the 21st Century. As a single woman back in the day, she wouldn’t have lasted five minutes; she’d have been sacked from the mill and thrown into the workhouse before you could say ‘spinning Jenny’. After swapping Liverpool for London, Kerrie has happily settled in the big smog. However, she readily admits that she misses her home city. “I visit the North regularly. I’ll be going up again soon, so I’m looking forward to it. I like living down here for the time being. When I get bored I’ll bugger off again,” she laughs. Her parents were bemused by Kerrie’s ambition to ‘tread the boards’, and begrudgingly agreed to her attending drama class. 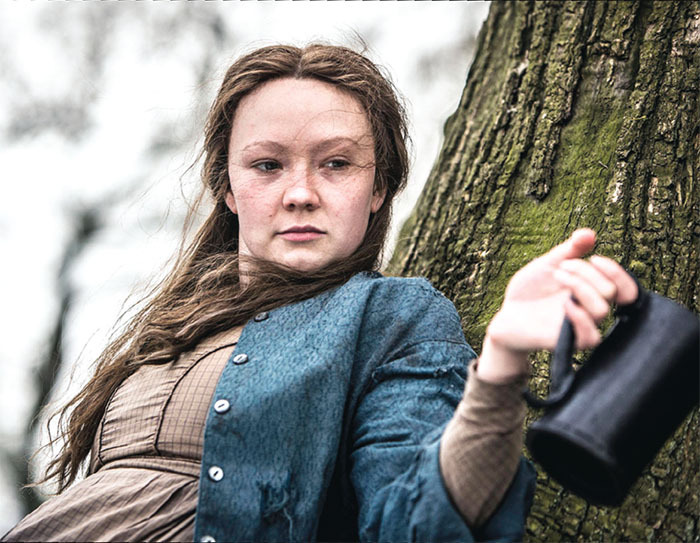 Luckily for Kerrie, her acting career took off and after landing the role of Ruby Moss in BBC’s drama Lilies at the age of 20, she hasn’t looked back.